Take Current Affairs quiz February 28, 2019 to enhance your General Awareness. Practice with our esteemed Current Affairs quiz February 28, 2019 questions which covers all important events across India as well as World. Make use of all important Current Affairs quiz February 28, 2019 questions with answers updated here, at free of cost to succeed in all competitive Exams and Interviews. Which State government launched the major water conservation scheme Jalamrutha? Karnataka State government launched a major water conservation scheme titled ‘Jalamrutha’, which focuses on drought-proofing measures, including protection and rejuvenation of water bodies. The Mahindra Excellence in Theatre Awards (META) awards is instituted by the Mahindra Group with the objective of becoming a significant platform for celebrating this art. Who won the Mahindra Excellence in Theatre Awards (META) Lifetime Achievement Award 2019? Mahesh Elkunchwar, an eminent Indian playwright, has been chosen for Mahindra Excellence in Theatre Awards (META) Lifetime Achievement Award 2019. The award would be conferred on March 12 during the Mahindra Theater Festival. Which organization fixes prices of drugs placed in the National List of Essential Medicines (NLEM)? The NPPA currently fixes prices of drugs placed in the National List of Essential Medicines (NLEM). Donald Trump and Kim Jong-un have begun their high-profile second summit in _______. US President Donald Trump and North Korea's leader Kim Jong-un have begun their high-profile second summit in Vietnam's capital, Hanoi. Under the Yogalakshmi scheme a new born girl child in the government hospital will be funded _________. The Mysuru City Corporation (MCC) introduced new schemes that included Rs.25,000 for each girl child born in government hospitals in the City. Who is the Union Minister of Railways? Piyush Goyal of the Bharatiya Janata Party is the current Minister of Railways, serving since 3 September 2017. BioAsia 2019-Asias largest Life-sciences and healthcare forum held in Hyderabad. The book ‘Quality, Accreditation, and Ranking – A Silent Revolution in the Offing in Indian Higher Education’ is edited by _______. The book ‘Quality, Accreditation, and Ranking – A Silent Revolution in the Offing in Indian Higher Education’ is edited by Shri Dr. H Chaturvedi . Union Textiles Minister Smriti Irani inaugurated the ‘Titanwala Museum’ in ________. Union Textiles Minister Smriti Irani inaugurated the ‘Titanwala Museum’ in Bagru, Rajasthan. The museum showcases the hand block printing of the Chhipa community in Bagru. India succesfully test-fired two indigenously developed QRSAM in the Odisha coast. What does QSRAM stand for? India has successfully test-fired two indigenously developed Quick Reaction Surface-to-Air missiles (QRSAM) from a test range at Chandipur in Odisha's Balasore district. Who is appointed as the Chairman of National Book Trust (NBT)? Educationist and Author Govind Prasad Sharma has been appointed as the Chairman of National Book Trust (NBT). Which of the following defence satellite would be launched by ISRO for DRDO in March 2019? Indian Space Research Organisation (ISRO) is set to launch an electronic intelligence satellite 'Emisat' for the DRDO in March. Which Indian becomes world's eighth-richest person with a net worth of $54 billion? As per Hurun Global Rich List 2019, Reliance Industries' 61-year-old Chairman Mukesh Ambani is the world's eighth-richest person with a net worth of $54 billion. He is the only Asian among the top 10. How much amount has been detected as GST evasion between April 2018 and February 2019? The government detected Goods and Services Tax (GST) evasion of around Rs 20,000 crore between April 2018 and February 2019. Out of this, ₹10,000 crore has been recovered. Who has been re-elected as President of Nigeria? Nigerian President Muhammadu Buhari has been re-elected for a second four-year term. Buhari, of the ruling All Progressives Congress party, secured 56 percent, or 15.2 million votes, in the February 23 polls. Defence Acquisition Council (DAC) recently approved purchase of defence equipment worth Rs ______ crore. The Defence Acquisition Council (DAC) approved acquisition of defence equipment for about Rs 2,700 crore. Are you looking for right place to enhance your Knowledge on Current Affairs of 28th February 2019 through effective Quiz section? 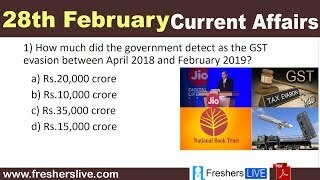 FreshersLive grants you the advantageous Current Affairs Quiz questions with accurate answers for 28th February 2019 which covers all the important events, supreme Awards, major occurrences in the National as well as World level. All important Current Affairs Quiz questions of 28th February 2019 are updated instantly in this page. Everyday at least 25+ Current Affairs Quiz Questions are displayed in this FreshersLive page. Correct Answer for each quiz question is given at the end of the entire 28th February 2019 Current Affairs Quiz questions section. You can estimate and upgrade your GK by attending these useful quiz questions. Entire quiz questions of 28th February 2019 Current Affairs covers Competitive Exam as well as Interview point of essentially important topics like International News, National News (ie. Indian Affairs), Science & Technology News, Environmental News, Bills & Acts Passed by Government, Defence News, About important Persons, Places, Banking & Economical News, Awards & Honours, Sports News, Revolutionary Updates on Arts & Culture, Obituary, Summits & Conference, Important Committee, Schemes, Appointments, Important Days & its Theme for Current as well as upcoming Year, Books & Its Authors, Agreements & MoUs, Budget, Taxes, Various Important Lists & Indexes, Visits by World Presidents, Prime Ministers, Political affairs and all Current Events. 28th February 2019 Current Affairs Quiz Questions updated in this page are prepared in the sense to help all aspirants to succeed in various Competitive Exams like UPSC IAS and other Civil Services Examination, Various Bank exams like IBPS PO, IBPS Clerk, SBI PO, SBI Clerk, RRB PO, RRB Assistant, Insurance exams like LIC AAO, UIIC Assistant, Railway Exams, Various Central Government Exams like SSC CGL, SSC CHSL, and more. Attempt all the Current Affairs Quiz Questions of 28th February 2019 and evaluate your score by matching your response with the correct answers mentioned at the end of this quiz questions section. By practising the FreshersLive Current Affairs Quiz Questions on a daily basis, you can surely succeed in the competitive exams as well as the interviews easily. Make use of this ultimate resource to the fullest and quickly achieve your goal!